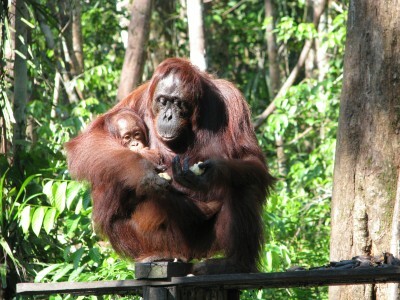 Female orangutans have a unique ability of birth control. One can only conceive a child when the adult female feels ready. If she's not ready yet, she'll make a whimpering sound to tell the adult male who's trying to mate her. Of course, sometimes the adult male doesn't care and may force her. But if that happens, the female still won't bear a child. One reason why a female isn't ready yet is when her child's still too young to stand on his/her own. 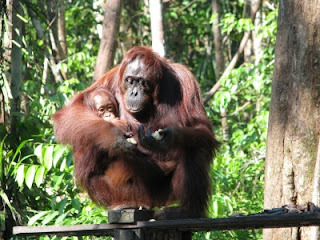 An orangutan mother will only take care of one child (assuming she doesn't bear twins) at a time. Only after the child can take care of him/herself, she'll be ready to conceive another child.